Starry night over Grand Teton Range. 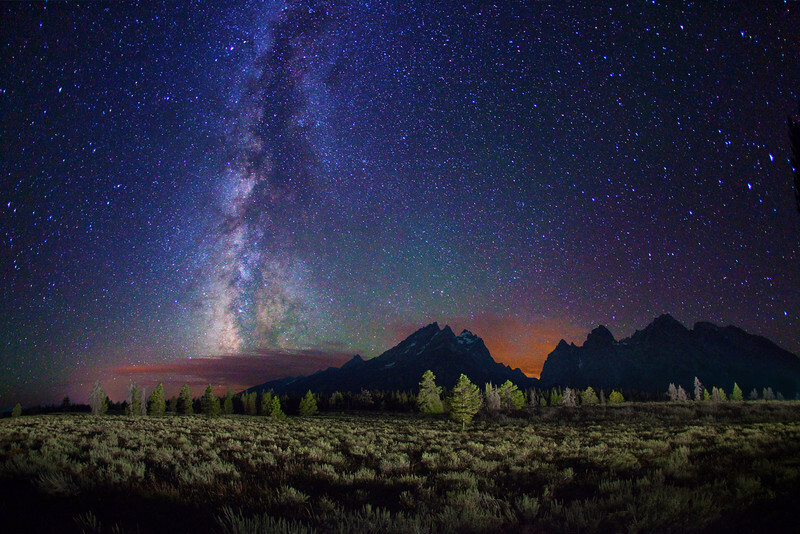 Milky Way stars over Grand Tetons from the Cascade Canyon Overlook in Grand Teton National Park. The foreground was light-painted with 2-million candlepower spotlight from camera right. This view is looking southeast, and was taken about three hours after sunset. The orange glow to the left of the Milky Way is light pollution from the town of Jackson, WY, about 20 miles away. The orange glow in the notch of the Teton Range is from the Idaho Falls metro area, about 75 miles away.